Get a sense of the local culture at Mount Washington and Carnegie Museum of Natural History. Appreciate the collections at Bicycle Heaven and Carnegie Museum of Art. The adventure continues: look for all kinds of wild species at Beechwood Farms Nature Reserve, look for gifts at Larrimor's, admire the masterpieces at Andy Warhol Museum, and wander the streets of The Strip District. For other places to visit, maps, photos, and more tourist information, read our Pittsburgh trip itinerary planning tool . If you are flying in from United Kingdom, the closest major airports are Pittsburgh International Airport, Erie International Tom Ridge Field and Cleveland Hopkins International Airport. In February, daytime highs in Pittsburgh are 5°C, while nighttime lows are -5°C. Finish up your sightseeing early on the 11th (Tue) so you can go by car to Cleveland. Get ready for a full day of sightseeing on the next day: examine the collection at Rock & Roll Hall of Fame, browse the eclectic array of goods at West Side Market, look for gifts at Campbells Popcorn Shop, then pause for some serene contemplation at St John's Cathedral, and finally try your luck at JACK Cleveland Casino. To see other places to visit, reviews, where to stay, and tourist information, read our Cleveland route planning tool . You can drive from Pittsburgh to Cleveland in 2.5 hours. Other options are to take a train; or take a bus. In February, daytime highs in Cleveland are 2°C, while nighttime lows are -6°C. Finish your sightseeing early on the 13th (Thu) to allow enough time to travel to Chicago. On the 14th (Fri), try to win big at Horseshoe Hammond, don't miss a visit to Millennium Park, then wander the streets of The Magnificent Mile, and finally admire the striking features of Chicago Cultural Center. Keep things going the next day: steep yourself in history at Ernest Hemingway Birthplace, then hike along Little Red Schoolhouse, and then tour the pleasant surroundings at Lincoln Park Zoo. To see traveler tips, reviews, where to stay, and other tourist information, read Chicago tour itinerary planner . You can fly from Cleveland to Chicago in 3.5 hours. Alternatively, you can do a combination of flight, bus, and subway; or drive. You'll gain 1 hour traveling from Cleveland to Chicago due to the time zone difference. February in Chicago sees daily highs of 2°C and lows of -7°C at night. Wrap up your sightseeing by early afternoon on the 16th (Sun) to allow time for travel to Columbus. On the 17th (Mon), you'll have a packed day of sightseeing: look for all kinds of wild species at Conkles Hollow State Nature Preserve, whizz through the canopy at some of the top local zipline courses and adventure parks, and then make a trip to Easton Town Center. To find where to stay, photos, more things to do, and more tourist information, you can read our Columbus attractions planner. Traveling by flight from Chicago to Columbus takes 3 hours. Alternatively, you can drive; or do a combination of train and bus. Traveling from Chicago to Columbus, you'll lose 1 hour due to the time zone difference. In February, daytime highs in Columbus are 5°C, while nighttime lows are -5°C. Wrap up your sightseeing on the 18th (Tue) early enough to travel to Washington DC. 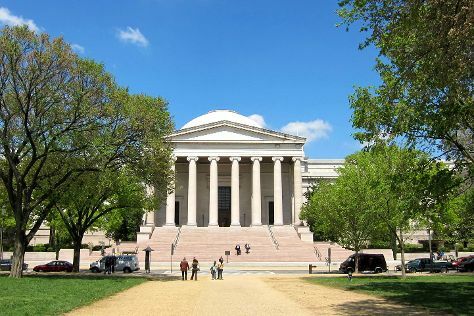 On the 19th (Wed), admire the masterpieces at National Gallery of Art, then examine the collection at National Air and Space Museum, then steep yourself in history at Arlington National Cemetery, and finally pause for some photo ops at Vietnam Veterans Memorial. On the next day, get a new perspective on nature at Smithsonian National Museum of Natural History, get engrossed in the history at United States Holocaust Memorial Museum, then stroll through National Zoological Park, and finally wander the streets of Old Town. You can fly from Columbus to Washington DC in 3 hours. Alternatively, you can do a combination of flight and train; or drive. Traveling from Columbus in February, expect Washington DC to be somewhat warmer, temps between 10°C and 0°C. Cap off your sightseeing on the 20th (Thu) early enough to catch the train to Baltimore. Kick off your visit on the 21st (Fri): make a trip to Inner Harbor, then admire the architecture and history at Fort McHenry National Monument, then try to win big at Horseshoe Casino, and finally appreciate the extensive heritage of Fell's Point. On the 22nd (Sat), you'll have a packed day of sightseeing: learn about all things military at U.S. Naval Academy, then let little ones run wild at Centennial Park, and then identify plant and animal life at Loch Raven Reservoir. To find more things to do, ratings, and more tourist information, go to the Baltimore trip planning app . Getting from Washington DC to Baltimore by train takes about an hour. Other options: drive; or take a bus. Expect a daytime high around 9°C in February, and nighttime lows around 0°C. Finish up your sightseeing early on the 22nd (Sat) so you can catch the train to Philadelphia. Start off your visit on the 23rd (Sun): explore the world behind art at Philadelphia Museum of Art, take an in-depth tour of Eastern State Penitentiary, then get a sense of history and politics at Independence Hall, then admire all the interesting features of Independence National Historical Park, and finally steep yourself in history at Liberty Bell Center. Here are some ideas for day two: explore the world behind art at Brandywine River Museum of Art, then contemplate the long history of Todd House, then explore the world behind art at Barnes Foundation, and finally hunt for treasures at Reading Terminal Market. To see photos, maps, reviews, and more tourist information, read Philadelphia trip maker website . Traveling by train from Baltimore to Philadelphia takes 1.5 hours. Alternatively, you can drive; or take a bus. In February, plan for daily highs up to 7°C, and evening lows to -1°C. Cap off your sightseeing on the 24th (Mon) early enough to catch the train to New York City. Start off your visit on the 25th (Tue): make a trip to The Metropolitan Museum of Art, then meet the residents at Central Park Zoo, then pause for some serene contemplation at St. Patrick's Cathedral, and finally appreciate the history behind 9/11 Memorial. Get ready for a full day of sightseeing on the next day: explore the wealth of natural beauty at Hamilton Grange National Memorial, explore the landscape on two wheels at East River Waterfront Esplanade, then wander the streets of Times Square, and finally take a stroll through Fifth Avenue. To find reviews, traveler tips, ratings, and more tourist information, you can read our New York City attractions planning app . Traveling by train from Philadelphia to New York City takes 2 hours. Alternatively, you can drive; or take a bus. In February, daily temperatures in New York City can reach 9°C, while at night they dip to -1°C. Wrap up your sightseeing by early afternoon on the 27th (Thu) to allow enough time to travel to Gorham. Gorham is a town in Coos County, New Hampshire, United States. Kick off your visit on the 28th (Fri): glide through natural beauty at Great Glen Trails Outdoor Center, fly down the slopes at Sunday River Ski Resort, and then take in the spiritual surroundings of St. Anne's Church. Get ready for a full day of sightseeing on the 29th (Sat): enjoy the sand and surf at Echo Lake Beach, take in the awesome beauty at Cannon Mountain, and then stop by Chutters. To see maps, other places to visit, and tourist information, read Gorham travel itinerary planner. The Route module can help you plan travel from New York City to Gorham. Plan for colder temperatures traveling from New York City in February, with highs in Gorham at -11°C and lows at -21°C. Wrap up your sightseeing on the 29th (Sat) early enough to travel to Madison. Madison is a town in Carroll County, New Hampshire, United States. On the 1st (Sun), delve into the lush surroundings at White Mountain National Forest, sample the fine beverages at Tamworth Distilling, then do a tasting at Sap House Meadery, and finally take in the architecture and atmosphere at The Little White Church. To see more things to do, where to stay, reviews, and other tourist information, refer to the Madison attractions planner. Getting from Gorham to Madison by car takes about an hour. Traveling from Gorham in February, expect Madison to be warmer, temps between 7°C and -3°C. Wrap up your sightseeing on the 1st (Sun) early enough to travel to Boston. Kick off your visit on the 2nd (Mon): shop like a local with Faneuil Hall Marketplace, wander the streets of Newbury Street, then admire the masterpieces at Museum of Fine Arts, and finally get to know the fascinating history of Freedom Trail. Get ready for a full day of sightseeing on the next day: wander the streets of North End, then contemplate the long history of Walden Pond State Reservation, and then look for gifts at sophia's greek pantry. To see reviews, ratings, maps, and tourist information, you can read our Boston online tour planner . You can drive from Madison to Boston in 2.5 hours. Expect a bit cooler weather when traveling from Madison in March: highs in Boston hover around 7°C, while lows dip to -1°C. Cap off your sightseeing on the 3rd (Tue) early enough to travel to Acadia National Park. Kick off your visit on the 4th (Wed): take in the natural beauty of Sieur de Monts Spring, then take your sightseeing to a higher altitude at Cadillac Mountain, then take an in-depth tour of Somesville Historical Museum and Gardens, and finally delve into the lush surroundings at Indian Point Blagden Preserve. On the 5th (Thu), you'll have a packed day of sightseeing: appreciate the extensive heritage of Great Meadow Walk and then stroll through Jordan Cliffs Trail. To see more things to do and tourist information, read our Acadia National Park trip itinerary planner . Fly from Boston to Acadia National Park in 4.5 hours. Alternatively, you can do a combination of flight and car; or drive. Prepare for slightly colder weather when traveling from Boston in March: high temperatures in Acadia National Park hover around 3°C and lows are around -6°C. Finish your sightseeing early on the 5th (Thu) so you can travel to Buffalo. Kick off your visit on the 6th (Fri): wander the streets of Elmwood Village, shop like a local with Walden Galleria Mall, admire the striking features of Frank Lloyd Wright's Darwin D. Martin House Complex, then admire the masterpieces at Burchfield Penney Art Center, and finally learn about all things military at Buffalo & Erie County Naval and Military Park. Get ready for a full day of sightseeing on the 7th (Sat): do a tasting at Willow Creek Winery, learn about winemaking at Liberty Vineyards Winery, then try to win big at Hamburg Gaming, and finally contemplate in the serene atmosphere at Our Lady of Victory Basilica. To see traveler tips, ratings, reviews, and other tourist information, use the Buffalo trip itinerary website . Getting from Acadia National Park to Buffalo by flight takes about 6.5 hours. Other options: do a combination of car and flight; or drive. In March, daytime highs in Buffalo are 4°C, while nighttime lows are -4°C. Finish your sightseeing early on the 7th (Sat) so you can drive to Niagara Falls. Kick off your visit on the 8th (Sun): try to win big at Seneca Niagara Casino, then examine the collection at Niagara Wax Museum of History, then admire the masterpieces at Castellani Art Museum of Niagara University, and finally take in the dramatic scenery at Niagara Falls. On the 9th (Mon), you'll have a packed day of sightseeing: steep yourself in history at Old Fort Niagara, see the interesting displays at Niagara Power Project Visitors Center, and then revel in the low prices at Fashion Outlets of Niagara Falls, USA. For other places to visit, reviews, maps, and tourist information, use the Niagara Falls trip app . Niagara Falls is just a short distance from Buffalo. March in Niagara Falls sees daily highs of 4°C and lows of -5°C at night. Finish your sightseeing early on the 9th (Mon) so you can drive to Detroit. Kick off your visit on the 10th (Tue): examine the collection at Motown Museum, explore the world behind art at Detroit Institute of Arts, see the interesting displays at The Henry Ford, then examine the collection at Greenfield Village, and finally identify plant and animal life at Oakwood Metropark Nature Center. Get ready for a full day of sightseeing on the next day: wander the streets of Campus Martius Park, stop by Polish Art Center, and then tour the pleasant surroundings at Detroit Zoo. For reviews, photos, ratings, and more tourist information, you can read our Detroit road trip planning app . You can drive from Niagara Falls to Detroit in 4.5 hours. Alternatively, you can fly; or take a train. In March in Detroit, expect temperatures between 6°C during the day and -3°C at night. Cap off your sightseeing on the 11th (Wed) early enough to travel to Baltimore. Start off your visit on the 12th (Thu): admire the striking features of Russell-Colbath Homestead, look for all kinds of wild species at Lost River Gorge and Boulder Caves, and then explore and take pictures at Kancamagus Highway. Keep things going the next day: do a tasting at Ricker's Hard Cider, then identify plant and animal life at Maine Wildlife Park, then see the sky in a new way at Mount Washington Observatory Weather Discovery Center, and finally stop by Zeb's General Store. For other places to visit, maps, more things to do, and other tourist information, read North Conway online journey planner . Getting from Detroit to North Conway by combination of flight, bus, and taxi takes about 8.5 hours. Other options: do a combination of flight and bus; or drive. Traveling from Detroit in March, expect North Conway to be a bit warmer, temps between 13°C and 0°C. Wrap up your sightseeing by early afternoon on the 14th (Sat) to allow time for travel back home.